Elected leaders in Bloomington Normal are calling for cool heads and reasoned conversation about public affairs. Bloomington Alderman Scott Black said that's the point of a rally over the noon hour Tuesday at which local elected officials will emphasize how they cooperate with each other across ideological lines. "And it's very troubling that people are un-friending folks on social media. They are meeting in the streets and yelling at each other. And I think that showing that elected officials can work together despite coming from completely different political persuasions is a value," said Black. 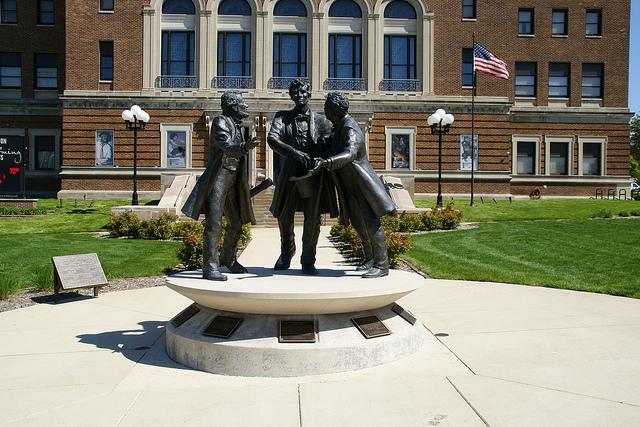 The rally will be at the Lincoln sculpture known as the 'convergence of purpose' statue near the Bloomington Center for the Performing Arts. You can hear the event during Sound Ideas on GLT. "We've seen a lot of things on Facebook and I really want to show the public that the elected officials are committed to hearing each other out and moving the community forward," said Black. Black said he hopes central Illinois leaders can model conduct and attitudes for national officials. Some members of minority groups in Bloomington-Normal said a Donald Trump presidency will undo several decades progress. About 200 citizens joined together on the courthouse square in Bloomington Wednesday night in a demonstration organized by Illinois People's Action, to say they still feel a better America is worth fighting for. Illinois State University President Larry Dietz has sent a message to the campus about the presidential election results. Dietz acknowledged in an email that Donald Trump's election has "shaken the sense of well-being" for many people leaving some fearful. However, University Chief of Staff Jay Groves says some are taking to social media, spreading rumors of criminal hate activity and racial slurs.